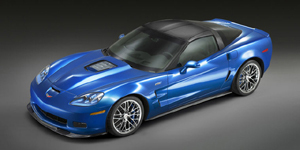 For 2009, the limited-production high-performance Corvette ZR1 joins the lineup. Powered by a 6.2-liter supercharged V8 with 638hp, the ZR1 features Brembo ceramic brakes, lighter-weight aluminum chassis components of the Z06, and carbonfiber for the roof, hood, and front fenders. Convertibles are available in a lower-priced 1LT trim. Find the used Chevrolet Corvette of your choice from a dealer in your area. Search our used car listings now.